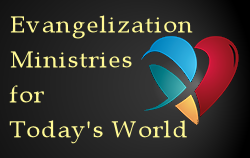 Patrick Campbell turned a childhood dream of being a superhero into a real life ministry of fighting evil. His Saint Benedict ministry prays for the healing of families. Here’s his story. Patrick Campbell, founder of The Cross of St. Benedict, has a ministry of praying for the healing of families. 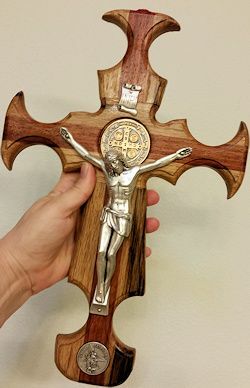 He and his family make beautiful crosses of St. Benedict as a powerful spiritual warfare weapon, like the one he is wearing in this video and like the one in this photo, which Terry and Ralph Modica (founders of Good News Ministries) purchased for their own home. The St. Benedict Cross is identified by the medal of St. Benedict at the center. Traditionally, the medal is known for its power to ward off the devil and his influences. On the medal is an image of St. Benedict along with a Latin inscription which invokes the Saint to protect us from the cunning of the evil one. Having had his own battles against Satan in his own life-time, St. Benedict has for centuries been a heavenly intercessor for protection and healing for those who call upon him. More and more, the medal of St. Benedict has spread thoughout the world as a powerful sacramental against evil. Now see the Good News Cross of St. Benedict that came from a vision given to Terry during Adoration of the Blessed Sacrament!